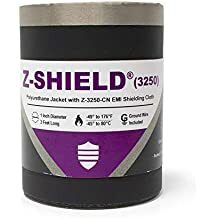 Zip Shield Sh1 - Emi Jackets And Expandable Sleeves - Emi Shielding - Products - ZT | Zippertubing Co.
Zip-Shield® (SH1) was developed as an extremely effective EMI shielding solution for hardening cable and wire bundles. 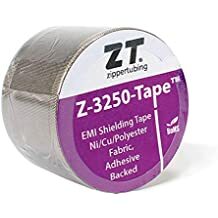 The jacket, track and aluminum foil combination provides excellent shielding performance and can be used in most general purpose applications such as electronics racks and network cable bundling. Zip-Shield® (SH1) is configurable in many different exterior material options, including colors, material thickness and pressure track closure options. All configurations come with a full length 15 AWG ground wire sewn in which provides options for both termination and grounding. 63-10 is a flexible, lightweight, .010" thick PVC film that has a soft rubber-like texture and an operating temperature range of -20° to +105°C. The material meets Mil-I-631D, Type F, Form S, Grade C, Class 1 and features good abrasion and fluid resistance in addition to being flame retardant. 63-10 material can be configured for round, flat and rectangular cable, may utilize most closure styles and comes standard with an internal overlap flap to meet ground based military application requirements. It can also be combined with most thin, lightweight EMI shielding material types. 63-10 should be the first cable jacket choice for economical and light duty applications. Tensile Strength 1,800 psi. min. Volume Resistivity 1010 ohms/cm. mm. SH1 Foil is a thin, lightweight shielding material that consists of a 1-mil Aluminum foil backed with a 1-mil Mylar (Polyester) film. It can be combined with most Zippertubing jacket materials and closure types to create a lightweight cable jacket with outstanding EMI shielding performance. The material is a general purpose shielding product that is ideal for use in protected areas like electronics racks and should not be used in areas where a great deal of flexing is likely to occur. It can be configured for Round, Flat and Rectangular cable shapes and is supplied with or without a sewn in 15 AWG braided Tin/Copper ground wire running the full length of the product. When using the SH1 Foil this EMI Shield material will be sewn to the selected jacket material and remain loose along one edge allowing the material to be easily removed from selected areas as desired. The SH1 Foil material is flame retardant but the final product flammability rating will be dependent on the outer jacket material and closure mechanism selected to create the final product. Electrical Resistance 15 ohms/mft @ 1.0"
Ground wires normally allow an electrical connection or transfer of the electromagnetic interference (EMI) from the component to a grounded connector. Zippertubing offers many different gauges of ground wires to meet the needs of your application. Our ground wires are comprised of tin-plated, copper-wire that are braided and formed into a flat configuration. They are used as an electrical ground drain, confirm to Federal Specification QQ-W-343E and American Society for Testing and Materials ASTM-B-575B specifications. Flat Thickness Variance +/- 0.002"